Gran Fiesta Tour is a gentle water ride inside the pyramid that dominates the Mexico pavilion. The ride stars the three characters from the 1944 animated film The Three Cabelleros: Jose Carioca (a Brazilian parrot), Panchito (a Mexican charro rooster), and Donald Duck (an American sailor?). 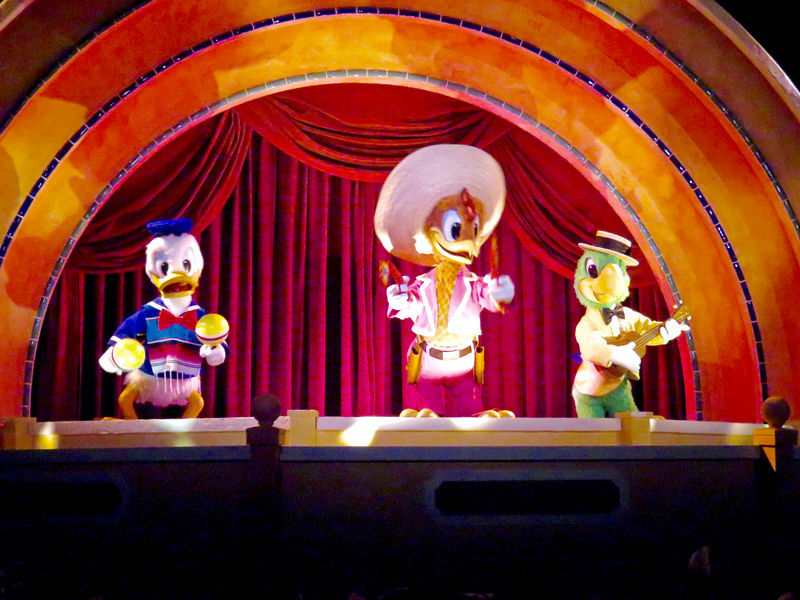 The primary purpose of the ride is to highlight the culture and arts of Mexico but the story is that The Three Cabelleros have to get to a concert where they are performing but Jose and Panchito realize that Donald has gone missing and they need to find him. This is a new ride updating the original El Rio del Tiempo but unfortunately they didn't do much to increase the wow factor with the result that this ride is still one that many people don't mind dropping from a busy schedule. Location: Inside the pyramid, towards the back and to the left of San Angel Inn restaurant. Wait Times: Wait times are generally short as many people do not even realize there is a ride in the Mexico pavilion. Queue Description: Made up to look like an ancient Aztec pyramid. Ride Access: Wheelchairs and ECVs should enter the attraction through the exit, where directions will be given on boarding the ride. Wheelchair Transfer: It is required that riders transfer from wheelchairs and ECVs into the boats used for the ride. This will require a step down to board and a step up to exit. Audio: There are audio portions to the ride, assistive listening devices are available at Guest Services. At this location: When the park opened in 1982, this space was already in place as part of the Mexico pavilion. The original ride in this space was El Rio del Tiempo or "The River of Time." That ride was a straight history, arts, and culture tour of Meixico but over the year never generated much excitement among park visitors and on January 2, 2007, after almost 25 years the attraction closed to be refurbished into the current version. The Attraction's History: The current attraction remains unchanged since it opened in April 2007.